Discover our fantastic selection of Cupcake Recipes and Baking Ideas all written by our expert professional chefs at L'atelier des Chefs, based in London. 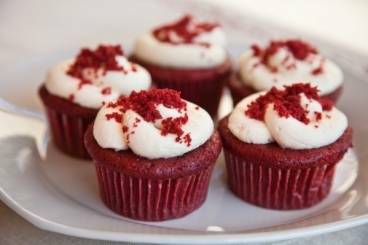 A quick and simple recipe to make perfect red velvet cupcakes topped with a vanilla flavoured buttercream icing. Spiced cupcakes made with candied ginger and mixed spices topped with a rich ginger caramel frosting. Coffee flavoured cupcakes filled with a coffee and white chocolate paste finished with a light coffee frosting and a dusting of coffee powder. A very basic and very quick recipe for delicious lemon scented cupcakes. A delicious and easy to follow recipe for a lactose free cupcake. An easy to follow recipe for light and moist banana cupcakes with a toffee flavoured topping. Quick, easy and delicious, these vanilla scented cupcakes are perfect for many an occasion. Quick, easy and delicious - this is a great recipe to have in your repertoire. Chocolate cupcakes with a cocoa buttercream topping. A delicious and unusual recipe for cupcakes, perfect for a summers day!